Do you want to brighten your smile? If the answer is yes, then you have come to the right place. The most commonly used teeth whitening procedures are professional home whitening systems and LED (in-chair) teeth whitening. 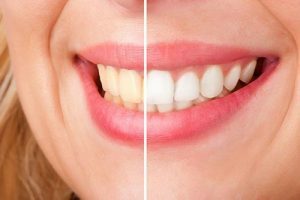 At Cardiff Dental, we offer these types of teeth whitening, and our experienced cosmetic dentist will help you choose the method that will help you to achieve the perfect shade of white you want. The whitening kit is simple to use and cost-effective. We will take impressions of your teeth and create moulds for your custom tray. The tray will be used to hold the bleaching gel in your mouth. Your dentist will provide you with instructions on how to wear and use them properly. You will need to wear the custom tray with whitening gel for only two hours per day. You can see the results in as little as one or two weeks. With this method, you control the degree of whiteness that you want to achieve. Teeth whitening done at the office is carried out by our dental professional using an LED lamp for teeth bleaching. The process will take 1 to 2 hours, depending on the degree of whiteness you wish to attain. The LED teeth method is by far the safest and most effective way of whitening a dull smile. At Cardiff Dental, we only use a first-class LED lamp and the best teeth whitening gel, which are guaranteed to be safe and effective. We use gum protection material to minimise the sensitivity during and after the procedure. You will be amazed at the results. If you want a brilliant white smile, come and visit us at Cardiff Dental today! We are committed to helping you achieve a healthy, white smile with our very best cosmetic dental procedures such as professional teeth whitening. It’s safe for your gums and effective for your teeth. To learn more about how we can transform your not-so-bright smile to a celebrity smile, schedule an appointment with us today. Contact us on (02) 4954 6888 today!